It is common for people to not be too familiar with at least one of these three terms, especially if they are not medical professionals. From a fertilized cell to a fully developed fetus, let us see how different these stages are and why each is very important. Forms when a male sperm cell fertilizes a female egg cell. First stage of the zygote’s development where its cells multiply to form their designated functions (differentiation). Refers to a point in the embryo’s development where it takes on a more human form, and some bodily functions begin to work. A zygote is a cell fertilized by the union of the ovum (i.e., egg cell), or the female gamete, and the sperm cell, or the male gamete. It contains the DNA from both its parents. The zygote then multiplies and develops through the process of cell division to form the embryo. The zygote is the first stage of development of the fertilized cell. While it is common for animals to keep the zygote inside their bodies, other animals including birds and most reptiles lay eggs where the zygote develops. Pregnancy starts once the zygote forms and ends when the mother gives birth to the baby. A human embryo at 9 weeks. The embryo is the first stage of development of the zygote as the fertilized egg goes through a rapid process of cell division. This is when differentiation happens, where the embryo’s cells multiply and take on various functions. The different stages in embryo development are the blastula, gastrula, and organogenesis stages. The blastula stage involves the formation of the blastocoels covered by blastomeres, a sheet of cells. The gastrula stage involves the division and migration of cells. The last stage is organogenesis, where the internal organs start to develop through a series of processes. The embryonic stage is crucial, as it is the time when the baby is most at risk from things that could cause birth defects. 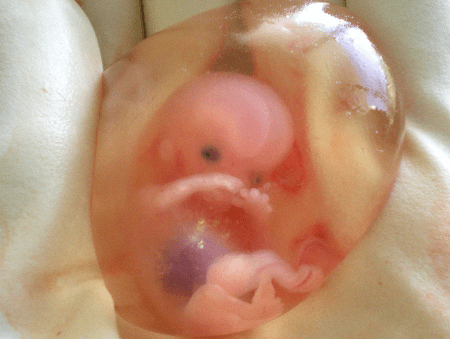 A human fetus at 10 weeks. A fetus (also called foetus), generally refers to a point in the embryo’s development where it takes on a more human form. This stage generally starts at the gestational age of eleven weeks since the fertilized zygote formed. The major body organs are now present in the fetus but are not yet fully developed or in their correct anatomical location. The fetus is usually 30 millimeters or 1.2 inches long from crown to rump, with the head making half of the fetal length. It typically weighs around 8 grams. Lungs start to develop through the help of breathing-like motions. Now, the brain, hands, feet and other organs are present with minimal function. This is also the stage where the placenta is fully functional and the genitalia starts to form. So what’s the difference between a zygote, embryo and fetus? Among humans, these are the stages of development from fertilization to birth. A zygote is a fertilized egg brought about by the joining of the female ovum and the male sperm. It contains the entire DNA, or genetic makeup, of the baby. Half of the DNA comes from the mother and the other half from the father. 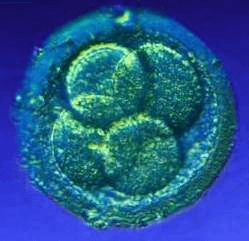 The embryo is the early stages of the zygote’s development. The embryonic cells multiply and start to develop various functions (also called differentiation). Once the embryo goes through its various stages of development, it grows at a rapid rate and internal organs start to develop, followed by the external organs. The fetus takes form at the start of the 11th week of the gestation period, looking more human than ever. More changes take place: the placenta forms and the internal organs such as the brain, heart and lungs, among others, start to develop.